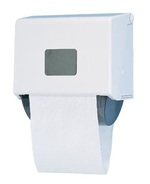 Metro is Kennedy’s compact size cloth roll towel cabinet ideal for smaller washrooms and light usage. The Metro provides hygiene, service and environmental benefits while delivering a ‘comfort like home’ hand drying experience for the end user. The consumable used with Metro – the cloth roll towel, is a natural biodegradable product making this system a positive choice for the environment. This cabinet delivers 100 portions of clean towel from a 65 ft. roll towel and is available in classic white.